The Hawaiʻi County Department of Human Resources periodically recruits applicants for police officers. Recruitment for Police Officer I (Recruit) is now closed. Visit the Hawaiʻi County Job Opportunities page and create an account. Fill out a Job Interest Card for a Police Officer. Be at least 21 years of age by closing deadline. Be a U.S. citizen (either born or naturalized), national or permanent resident alien of the United States, or eligible under federal law for unrestricted employment in the United States. Have a valid driver’s license from Hawaiʻi or comparable license from another state. Have a combination of education and experience substantially equivalent to graduation from high school. Be qualified to carry and possess any firearm or ammunition in accordance with state and federal laws. Persons convicted of domestic violence, whether convicted of a misdemeanor or felony, will not be considered for a position because federal law prohibits them from carrying firearms. Good eyesight. Candidates for employment must have 20/20 binocular vision with or without correction. Those who wear soft contact lenses must have at least 20/200 vision before correction, corrected to to 20/20, and those wearing hard contact lenses or glasses must have 20/40 binocular vision before correction to 20/20. Good physical condition and agility according to standards set by the county’s Pre-Entry Medical Examination Guide. The starting salary for Police Officer I is $5,143.00 a month. Officers receive night differential pay and time and a half for holiday work and overtime. Holidays — 13 paid days a year, plus all election days except the primary election. Vacation — 21 working days a year. The unused portion may be accumulated up to 90 days. Sick leave — 21 working days a year. The unused portion may also be accumulated toward retirement. Military leave — full pay for up to 15 working days a year for active duty or annual training. Funeral leave — three working days with pay for death of qualified family member. Accidental injury leave — upon choice of plan, full pay up to 120 working days for each work-related injury. Health insurance — self or family medical, drug, vision and adult dental insurance partly subsidized by the County of Hawaiʻi. Life insurance — fully subsidized group life insurance for $26,000. Coverage varies with the age of the employee. 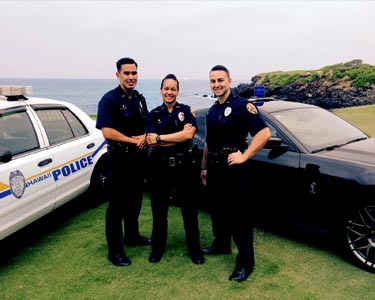 Uniforms and equipment — furnished by the Hawaiʻi Police Department. Automobile subsidy — monthly allowance for private automobiles in police use, plus fuel and oil and tax-exempt motor vehicle registration if position requires the use of a vehicle. Retirement — eligible for retirement with 25 years of police service in Hawaiʻi. For more information on how to apply, go to the County of Hawaiʻi Job Opportunities web page.